I’m not just a slow runner, I’m Struggling Runner. Every run for me is a fight. Before I leave the house I have to put forth real effort not to take off my shoes and watch tv instead. During every run I have to ignore the voice in my head telling me I can just give up and turn around. That is why I loved this book. 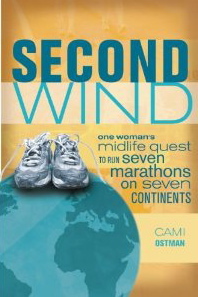 The author, Cami Ostman, is not a natural born runner, but she still runs. In fact, she runs marathons, on every continent. Even Antarctica. Cami starts using running as a way to deal with the emotional fall out of her divorce. Soon running is a large part of her life and her new relationship, and she and her new husband decide to run a marathon on every continent. She is a slow runner, but she still runs. She is afraid of being attacked during her training runs, but she still runs. She struggles through her runs, but she still runs. Her marathon experiences range from awesome to tortuous, but she powers through each one, including the one with the stomach problems, and the one she was told she couldn’t run. Which just goes to show to most important thing you can have when you are running a marathon is willpower. The thing I liked best about this book is that it made me feel like I could actually run a marathon. Her writing is comfortable and she doesn’t preach about running techniques or any of that crap, she just talks about how she experiences running. This entry was posted in Uncategorized and tagged Books, Running. Bookmark the permalink.